A big tent drama and romance, Trapeze creates an impressive canvass but gets hopelessly bogged down in a distasteful and seemingly interminable love triangle. 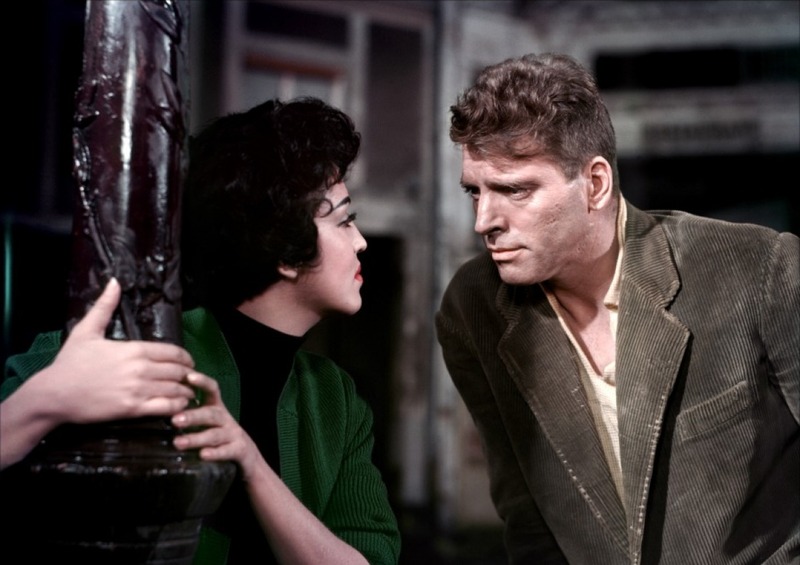 Mike Ribble (Burt Lancaster) was a legendary trapeze artist who permanently damaged his leg in a fall while attempting the near-impossible triple somersault in mid-air. Now reduced to working as a rigger in a Paris-based circus, Mike is approached by the young and enthusiastic Tino Orsini (Tony Curtis). Blessed with an abundance of raw talent as a trapeze artist, Tino eventually convinces Mike to return to performing as his catcher with the aim of perfecting the triple. Mike and Tino train hard and make good progress as the big opening day approaches. Meanwhile, the glamorous Lola (Gina Lollobrigida) is a member of a middling acrobatics show at the same circus. Overly ambitious and blindingly egotistical, Lola is looking only at self-preservation and her own career advancement. She dumps her fellow acrobats and attempts to weasel her way into the Mike and Tino act. Mike is vehemently opposed to the duo becoming a trio, believing Lola to be a distraction, but she is not an easy lady to dissuade, and will use every weapon at her disposal. Directed by Carol Reed in CinemaScope, Trapeze aims for a busy, boisterous vibe with something happening in every corner to animate the large screen. The film is only partially successful. While Burt Lancaster (an actual circus acrobat in his younger days until forced to quit due to injury) and Tony Curtis provide good star power and committed performances, the script offers them sub-par material to work with. A gaggle of writers were involved trying to wrangle the Max Catto novel The Killing Frost into a movie, and the lack of a single strong vision is apparent. The film is an uneasy mix of disjointed grand spectacle and nasty personal feuds. The final hour is fully consumed by Lola's disruptive influence on Mike and Tino, and Trapeze slips down a slippery slope of obnoxious behaviour. Reed is unable to find level ground to steady the drama, as Lola's conniving is matched by Mike's plotting. Lola pretends to love Tino because she wants into the show, Mike pretends to love Lola because he wants her out of the show, and Tino is buffeted by emotional waves propagated by a presumed lover and an essential performance partner. Lola is presented as a wholly unsympathetic character, helping to push the whole love triangle into sordid television soap opera territory, leaving behind a circus context struggling for relevance. The surrounding backstories are mediocre and rarely liven up the film. There is the gruff circus owner, the New York-based rival circus tycoon who promises a better paycheque, the midget who is growing too tall and is supposed to provide comic relief but doesn't, and an underdeveloped sub-plot involving Mike's former lover Rosa (Katy Jurado). None of them really register. Better are the actual trapeze performance scenes, and Reed uses these sequences sparingly to maintain their effectiveness and impact. The quest for the elusive triple is presented as an almost spiritual obsession, and gives the film some positive purpose. Close-ups for the stars are seamlessly woven into long-shots for the stunt trapeze artists, and the film is in its element delving into the rigours of training and the stress of performing in front of a large tent full of expectant spectators. Trapeze has a few tricks and performers worth watching, but the show rarely soars.